I love your site, it's very informative and inspirational! I have a somewhat urgent inquiry. 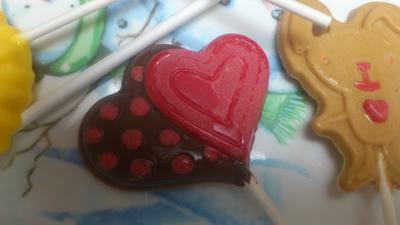 I am making chocolate lollipops using moulds for a charity event. I'm using coloured candy melts. When I did my test batch a few weeks ago, they came out of the mould looking perfect. I did a couple last night and unfortunately they weren't as good. 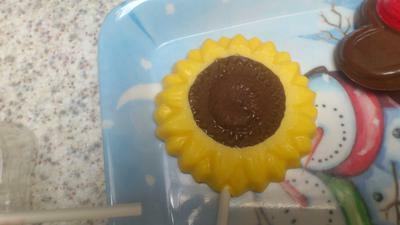 Where I've added colour, some of the coloured chocolate remains on the mould and the lollipop looks dull as a result. I'm melting the wafers correctly.....dried my moulds correctly....what is causing this? I've posted some pictures, too, so I hope you can see the white residue I am referring to. I actually melt the chocolate using double boiler method.....bowl of melts over a bowl of hot water. Should I be adding shortening? It looks to me like the white discoloration on your chocolate lollipops might be from chocolate bloom (separation of the fats in the chocolate) which is generally due to temperature changes. How are you cooling your chocolate lollipops? Room temperature? Fridge? Freezer? If you are certain that you have cleaned and dried your molds properly, it shouldn't be a residue from the molds causing the problem. You can "polish" the molds a bit before use using a lint free cloth (like one you would use to clean your eyeglasses). Yes, you can add a bit of shortening to your chocolate when melting in an effort to retain that shiny look. Just be extra careful that you are not overheating the chocolate during the melting process and not chilling the chocolate too long to avoid the bloom. I hope this helps and that your chocolate lollipops for the charity event turn out beautifully. Be sure to let us know and maybe send us some photos of the final results and we'll add them here.